Man's best fRiend so many tales. 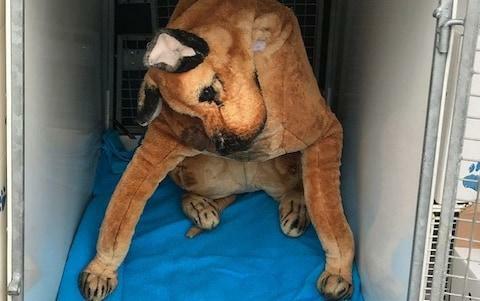 Animal rescuers rushed to the aid of a dog stranded on a roof - only to find a 4ft cuddly toy. He said: "I must admit it was such a relief. I had been preparing myself for what could have been an extremely distressing and difficult job, and then I realised that it wasn't a dog at all! " 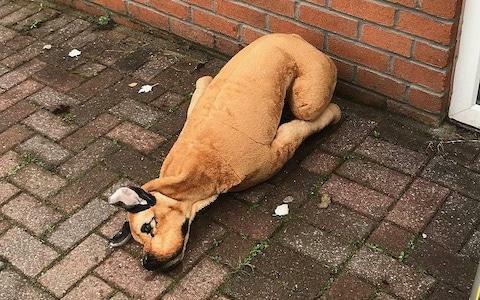 The woof on the roof drama started when a caller spotted the Great Dane-style toy on top of a flat roof of the Elim Pentecostal Church. The RSPCA inspector rigged up a ladder to reach the pooch - and then carefully took it away in his van. Insp Duguid said: "We get calls to all sorts of things - all animals of all shapes and sizes and species. "But in my 37 years as an RSPCA inspector I have never been called to rescue a cuddly toy before!" The RSPCA receives more than 1.1 million calls to its 24-hour emergency hotline each year. But Inspector Duguid welcome that some of the calls provide some light relief from distressing complaints of cruelty. just as my heart and feelings [dog lover] where about to take a turn for the worse,that is one happy ending,i would like to know if the rescued one will be up for TENDER. i have a freind who would put it in his suit case when coming here in 4weeks time.we lost our sleeping partner over 6months ago to illness,so he would definatley be welcomed in our bed. Dogs are better than women as companions. It hurts more when a dog leaves too soon. Why was it there...did somebody scale the roof and leave it behind? Dogs are better than women as companions. .
port talbot the home of steel making and pigeons,so its only a TAFF would put his doggy up there to scare away the hawks. Maybe the vicar had been shagging it?